SOLAR IMPULSE LANDS IN HAWAII AFTER LONGEST NON-STOP SOLO FLIGHT IN HISTORY ON SOLAR POWER! | "Global Possibilities"
Home » Energy » SOLAR IMPULSE LANDS IN HAWAII AFTER LONGEST NON-STOP SOLO FLIGHT IN HISTORY ON SOLAR POWER! SOLAR IMPULSE LANDS IN HAWAII AFTER LONGEST NON-STOP SOLO FLIGHT IN HISTORY ON SOLAR POWER! A solar plane attempting the world’s first flight around the globe has landed in Hawaii, after breaking the record for the longest non-stop solo flight in history. Solar Impulse 2, piloted by the Swiss pilot André Borschberg, took off from Nagoya in Japan at 3am on Monday, for the five-day crossing of the Pacific Ocean, the riskiest leg of its journey. At 72 hours into the eighth leg of its 22,000-mile circumnavigation, Borschberg broke the endurance record for a solo flight. Borschberg is sharing the round-the-world attempt, completing alternate legs with his co-pilot Bertrand Piccard, who will now fly the single-seater plane on a 100-hour leg to Phoenix, Arizona, in the US. Saving power is key to the journey’s success, as the plane – fitted with 17,000 photovoltaic solar cells – must reach heights of 9,000 metres during the day so that it can glide through the night. At top speed, it reaches 87mph. “There’s a lot of uncertainty at the end; we cannot know everything,” said Piccard, before the flight took off on Monday. During the 5,079-mile leg, Borschberg has spent about four days, 21 hours and 52 minutes in the air and throughout the journey has only been able to rest in 20-minute intervals. The 62-year-old veteran pilot and engineer has had to endure temperatures close to 37C (100F) in the cockpit. He said that yoga had been a “huge support” for sustaining a positive mindset and helped to keep him alert. 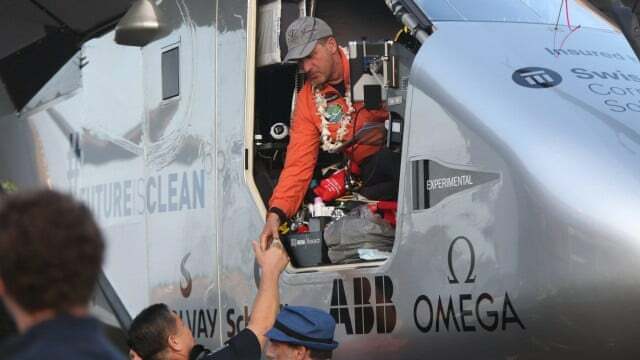 Tweeting throughout the journey, Borschberg said on Thursday that the fourth day of this leg had been tough, after he “climbed the equivalent altitude of Mount Everest four times”. The historic journey has been set back multiple times since first taking off from Abu Dhabi in March. It had been stalled in Nagoya for weeks due to bad weather, waiting for a suitable five-day window of clear weather to complete the journey. The original flight was diverted from China in June. On the most recent leg, there were concerns that Borschberg would have problems crossing a cold-weather front before Hawaii, ahead of the home straight over the Pacific archipelago.